Premier Houseboats are pleased to be able to offer an exclusive opportunity for residential moorings in Gweek, one of the most stunning settings in which to live on a boat in the UK. 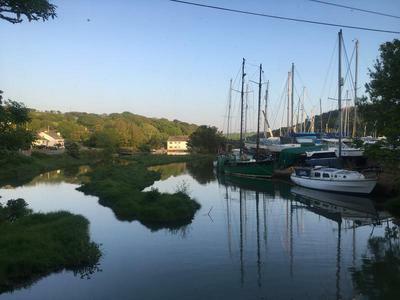 Gweek is a beautiful and peaceful village on the Helford river in Cornwall, with the boatyard sited right in its centre, offering the opportunity to become part of a friendly and idyllic community, both within the boatyard and the village. Gweek Boatyard is now able to offer residential moorings for up to twenty houseboats. The boats that are able to be moored there will need to be moveable under their own power, ideally of a Dutch barge or widebeam narrowboat style. To be able to live on your boat at Gweek you will be expected to maintain your boat to a high standard, and regularly take your vessel out of the water for maintenance and any external aesthetic work that is needed to ensure the beauty of the surroundings is maintained. Gweek Boatyard will be able to supply all the facilities you will need to achieve this high level of maintenance, and be able to insure your boat to a fully comprehensive level. On the boatyard, which is also a working boatyard, there are professionals available to assist in every aspect of boat maintenance. Facilities such as mains electricity supply, mains water supply, black and grey water pump out facilities, parking and a high level of security will be available. The moorings will be created on a first come first served basis, and given the lack of available residential moorings in Cornwall this represents a truly life changing opportunity. As can be seen from the photographs, this is an area of exceptional natural beauty, and this will be enhanced by the look of the residential vessels moored there. The cost to create these moorings is considerable, and the opportunity to reside on a houseboat in Cornwall is extremely rare, and this is reflected in the cost to secure one of these exclusive moorings. If you already own and reside on a houseboat and want to change location, or you dream of buying a boat and living in one of the most stunning locations in the UK, then this is an opportunity not to be missed. Vessel name: Moorings Disclaimer Premier Houseboats offers the details of this advert in good faith as it was presented by the seller or his representative but cannot guarantee or warrant the accuracy of this information nor warrant the condition of the described item within this advert. A buyer should instruct his agents, or his surveyors, to investigate such details as the buyer desires validated. The Item described within this advert is offered subject to prior sale, price change, or withdrawal without notice.